An old man walked into the James Avery store in Pearland on Saturday. He approached the lady behind the counter and held out the latest James Avery catalog. “I’d like to buy this cross, please,” he told her, indicating a lovely gold cross pendant that had clovers at the end of each bar. The old man’s eyes filled with tears. He felt compelled to tell the nice lady his story. “You see, my wife is dying,” he began. “I’ve been taking care of her for months, and it won’t be long now. Years ago, she had this same James Avery cross, but it was stole n in a break-in. 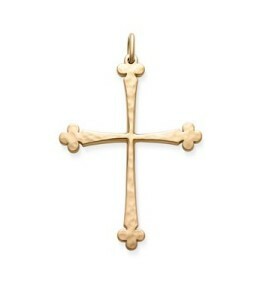 At that time, back in the ‘80’s, James Avery had stopped making this cross, so we were never able to replace it. This morning, my wife was looking through the new catalog and said with happy surprise, ‘Oh, look, honey, here’s that cross I loved so much!’ I told her I would go right out and get it for her, so that she could enjoy it…for a few days. “No. Thank you,” said the old man, “but I can’t be gone from my wife’s side for that long. I have to go back home now. Let’s go ahead and order the one from Kerrville.” And he left. “Oh, thank you!” the old man replied with true appreciation. He went to the store that afternoon, picked up the cross, and presented it to his wife. She immediately asked him to put it around her neck, and she admired it and held onto it all afternoon.